Everyone from Julia Roberts to Secretary of State Hillary Clinton is touting the power of clean cookstoves as a critical tool to improve the lives of the poor. To propel the clean cookstove movement forward, Bankers without Borders partnered with social enterprises Affirm Global Development and The Paradigm Project to help them achieve their goal of distributing 5 million cookstoves in developing countries by 2020. Bankers without Borders’ volunteers researched the creation of an internal funding facility to help finance the purchase and distribution of the cookstoves in Kenya. In Kenya, only 17.6 percent of those in rural areas, and 41 percent of the urban population, have access to formal financial services and even then interest rates are high. Using skilled volunteers to inform the Paradigm Projects new funding facility will enable aggregators, dealers, and Last Mile Entrepreneurs to have access to appropriately priced and structured financing that will improve cookstove sales and outreach. A team of four volunteers, based in locations ranging from Cherry, Pennsylvania, to London, England, collaborated on this project. Collectively, the volunteer team brought more than 70 years of financial sector experience to the table. Working together to gather requirements, conduct market research, and establish recommendations on financial product design, Ronak Sampat, Robert Rout, Wendy Bell, and Melissa Burba spent more than 200 hours servicing the Paradigm Project. 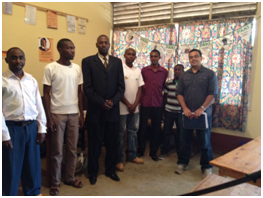 Team lead, Ronak Sampat, a Vice President at J.P. Morgan, also traveled to Kenya to spend a week on the ground with Paradigm staff to learn about their business objectives, collect data from a sample population of the supply chain and sales channels, and meet clients using cookstoves in action. Bankers without Borders is seeking new partnerships with social enterprises around the world. Learn more about what it means to partner with us by reviewing our Orientation for New Clients and Project Managers presentation.